Jimmie Johnson was the mane man at Dover. Wearing an afro clown wig – tufts of green, red, yellow and blue could be spotted from the stands – Johnson had to admit it was hard to take him seriously while he played the role of race jester. Some guys just have all the fun. That especially includes on this track. Johnson romped again at Dover (Del.) International Speedway, racing his way into the track’s history books on Sunday with his seventh win on the concrete, matching the mark held by Hall of Fame drivers Richard Petty and Bobby Allison. No active driver owns the track like the five-time Sprint Cup champion. Johnson led 289 of the 400 laps and looked every bit like the driver who swept the two Cup races at Dover in 2002 and 2009. Johnson last won at Dover on Sept. 26, 2010. He also won the September 2005 race. “God, I love this place,” Johnson said as he took a victory spin. They had good reason to clown around. Throw in the All-Star race and that’s a sweet four-race winning streak for NASCAR’s top organization. Petty needed 46 races to win seven times and Allison had 35 races. Johnson got to seven in his 21st start at the track known as the Monster Mile. Kevin Harvick, Matt Kenseth, Dale Earnhardt Jr., and Clint Bowyer rounded out the top five. 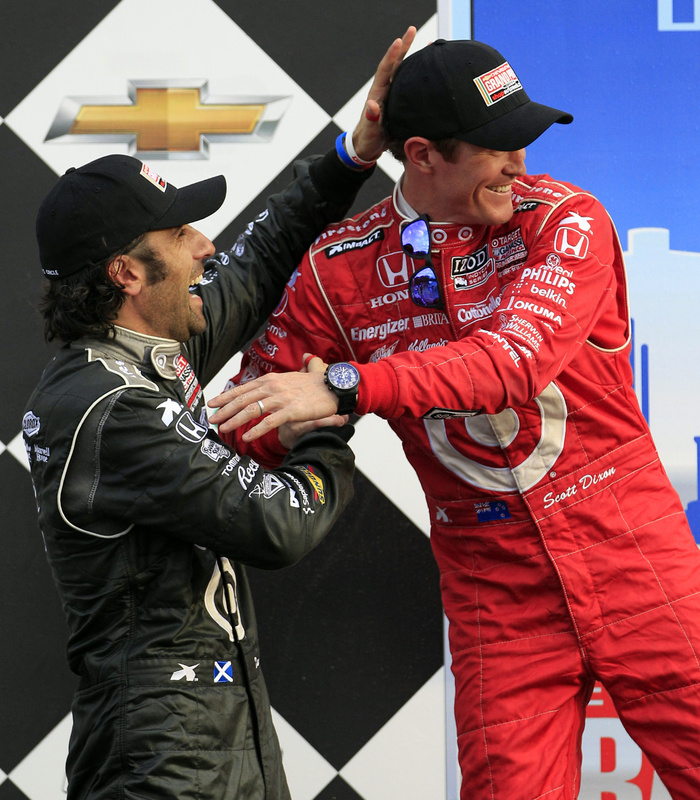 Scott Dixon won IndyCar’s Detroit Grand Prix that was marred by poor track conditions that stopped the race for a little more than 2 hours. A red flag halted the event 45 laps into a race that was scheduled for 90 laps and shortened to 60. Belle Isle’s 2.07-mile road course that hadn’t hosted a race since 2008 had chunks of asphalt and concrete missing. Pot holes and grooves that were recently filled with tar became exposed. Crews filled the gaps with epoxy that settled enough for the race to resume. The sprint to the finish was stunted by a caution flag because light rain made a slick track even more slippery. Helio Castroneves spun out as if his car was on a skating rink and finished 17th. Dixon pulled away after the final restart on lap 55 for his first win of the season, almost 2 seconds in front of teammate Dario Franchitti. The reigning Indianapolis 500 champion made many moves in limited time after starting toward the back of the pack in the 25-car field. Simon Pagenaud finished third, followed by Will Power. The first sign of trouble with the track came when James Hinchcliffe lost control because of a huge divot in the road and ran into a tire barrier when he was on lap 39. Steve Torrence earned his second Top Fuel victory of the season, beating Brandon Bernstein in the final round at NHRA SuperNationals in Englishtown, N.J.
Johnny Gray (Funny Car), Greg Anderson (Pro Stock) and Eddie Krawiec (Pro Stock Motorcycle) also were winners at the Full Throttle Drag Racing Series event at Old Bridge Township Raceway Park.